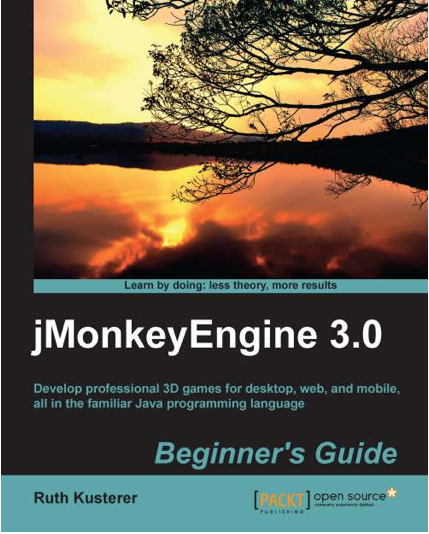 I recently downloaded the demo of a jMonkeyEngine based game called 3079. On the one hand, this open-world game looks “primitive” and minimalistic (similar to Minecraft). On the other hand, oh my, this is totally “playable”, it draws you in. If you’re curious, also read Interview with the developer of 3079. Very nice starting sequence where your character parachutes out of the sky, falls through clouds past floating cloud-cuckoo islands, watches some red monsters from afar… or not so far… Soon you lose contact with your base, but you receive one last message: Find out the reason for the “eternal war” that has enslaved this planet. On the ground, an angular world, a few buildings, trees, lakes. Simple boxshaped NPCs bop around, seemingly occupied by constant battle. Typically, this is the moment when some of them turn against you, and you better run for cover. Find a building that is neutral towards you, buy equipment, and receive missions. After the fourth time or so, I finally survived long enough to reach a merchant and a quest master. I had learned how to land savely on the ground without breaking the character’s neck and losing all newbie equipment. I could tell mosts friends from foes, and distinguish which faction owns which building (so I could stay close to the one faction that was neutral towards me). I learned how to interact with friendly NPCs, how to use elevators, and I understood that, somewhere, there is a lot of equipment worth trying out. However, the demo’s time limit always ran out before I even remotely started to solve the mission (so I can’t tell you anything more). Under different circumstances, I’d be pretty annoyed by this first impression. I left the author a bit of feedback and asked whether he could lower the bar a bit. I think the single most helpful thing for this type of game would be something like an embedded implicit training level. Optimally, a training level is smoothly integrated into the game and the player hardly notices it is there. Having a training level basically means that the game does not bring out the big guns from the first second on. It gives the player a limited save environment to acclimatize and learn the user interface. In the case of 3079, a training level could have been introduced on one of the cloud-cuckoo islands. An experienced player knows how to steer clear off the newbie island and how to go on parachuting straight to the surface — he should be allowed to just skip it. A newbie would be curious about the floating island under his feet, he doesn’t know yet there is a planet surface. The game pops up tooltips that advise him which keys to press to land smoothly, how to walk along a trail on the island, how to pick up and load a newbie weapon, how to aim and shoot at a non-lethal target, how to open a door, how to use a grapling hook (“I HAVE A GRAPLING HOOK? !”), etc. If the player fails at any task on the floating island, he can try again without penalty. At the end of the floating island, the tooltip advises the player how to continue his journey to the surface. In other words: If your game must use more inputs than Myst, consider adding a short training “level”. Myst, for the record, handled only one input: “Left click” covered everything from walking, to opening doors, pulling levers, and pressing buttons… Beat that!